What’s the difference between ARGUE and DISCUSS? When we use the verb argue, we mean that we have a fight with words. You can also say to have an argument with someone. When we use the verb discuss, we mean that we have a conversation with someone about a serious topic. ✅ Don’t argue about money! ✅ In business, you should always discuss the options with your colleagues. ❎ I must discuss about it with my wife. ✅ I must discuss it with my wife. This mistake is very common with students of English who speak Spanish, Portuguese and Italian. For example: The manager argued for an increase in employees wages. For example: My friend and I argue about football all the time. For example: The children argue over the remote control for the T.V. all the time. 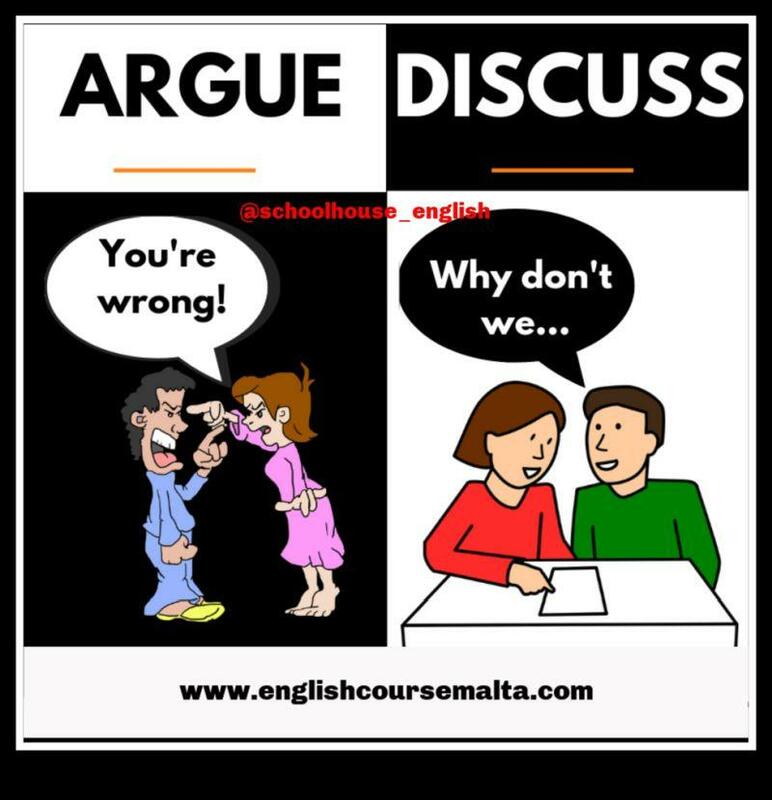 How to use ARGUE THAT – this form is very common! For example: You could argue that there are certain situations in which the risk of serious harm is obvious. Some people would argue that marijuana should be legalised. One could argue that it is more important to consider what is for students’ benefit rather than what they want. Mandy would argue that in the past there were less opportunities for young people. We could discuss in further detail when we meet. Please discuss it with your team and let me know your decision. If there are no other subjects you wish to discuss we may end the meeting now. We will discuss ways in which the problem can be resolved. They discussed it with us in great detail.